Infant mortality rates have dramatically decreased in Vietnam over the past two decades. In spite of this progress, rates still remain nearly four times higher than in high-income countries and health indicators suggest that there is still a need to improve clinical skills and practices. Thousands of critically-ill children are treated each year at the Vietnam National Children’s Hospital (VNCH) (formerly named the National Hospital of Pediatrics) in the capital city of Hanoi, Vietnam. As the country’s leading pediatric referral center, the VNCH is committed to ensuring that Vietnamese children have access to the same standard of comprehensive healthcare as other children in the world. 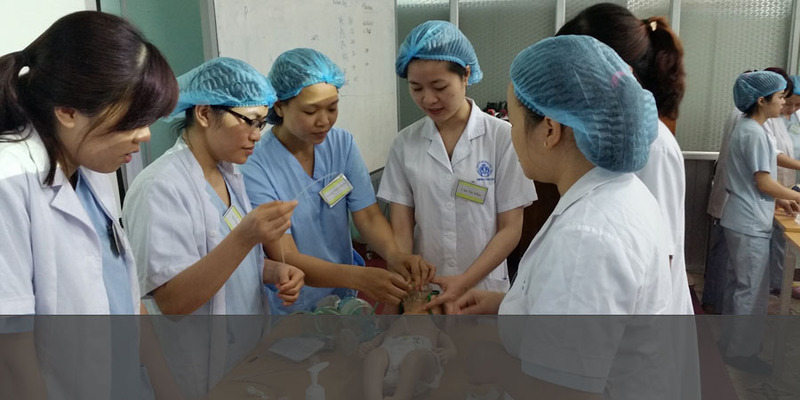 Our program in Vietnam strengthens the ability of emergency department and ICU physicians and nurses to deliver care at both local and national levels. We are helping the VNCH to develop and implement standardized practices that will enable medical staff to recognize early onset of illnesses and provide children with the appropriate life-saving care. The ultimate goal of the program is to establish a nationally replicable model for regional pediatric hospitals outside of Hanoi. Our three-year program in Vietnam is made possible through a generous grant from Ronald McDonald House Charities.